I had a chance to shoot with a preproduction model of the Panasonic DMC-TZ5 at PMA in January. The "TZ" stands for travel zoom, and this is a terrific "on the go" camera. Starting with the 10X Leica DC Vario-Elmarit optical zoom (28-280mm equivalent), the little compact can handle a variety of shooting situations. The image stabilization works wonderfully, and having the option of choosing among aspect ratios (4:3, 3:2, or 16:9) is a creative plus. This latest version provides HD movie capture at 1280 x 720 @ 30 fps. The accompanying audio is recorded with an onboard mic, so it isn't as good as the visuals, but still a great option to have while traveling. The picture of Hoover Dam that I shot with the TZ5 is featured on the fourth page of The Digital Photography Companion across from the credits. I was able to add the image just as we were going to production. 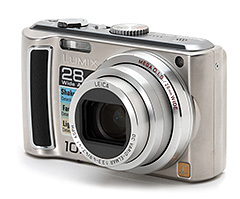 DP Review has posted an in-depth examination of the Panasonic TZ5. If you want to know more about this little travel gem that sells for about $300 US on Amazon, I would take a look at what Lars Rehm has to say.